Hello Frndzzz.... www.dealsnloot.com Back With New Free Sample Offer. Now Asian Paints offering Assured Free Copy of Asian Paint Beautiful Ezycolour Painting Homes Guide and Chance to win win a Free painting room makeover when you register at AsianPaints. Asian Paints introduces the “Asian Paints Beautiful Homes Guide”. This book offers colour ideas, product solutions and painting tips thus helping each consumer achieve his/her desired “Beautiful Home”. 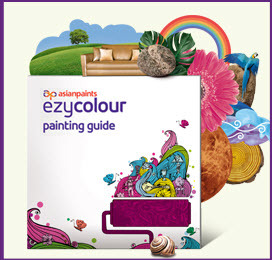 Get a Free copy of ezycolour painting guide to handhold you through the journey of creating your beautiful home. A chance to win a ‘My beautiful room’ makeover for your room, the Asian Paints way.